Working with animals requires a love of animals and the knowledge of how to work with them safely to properly take care of them. 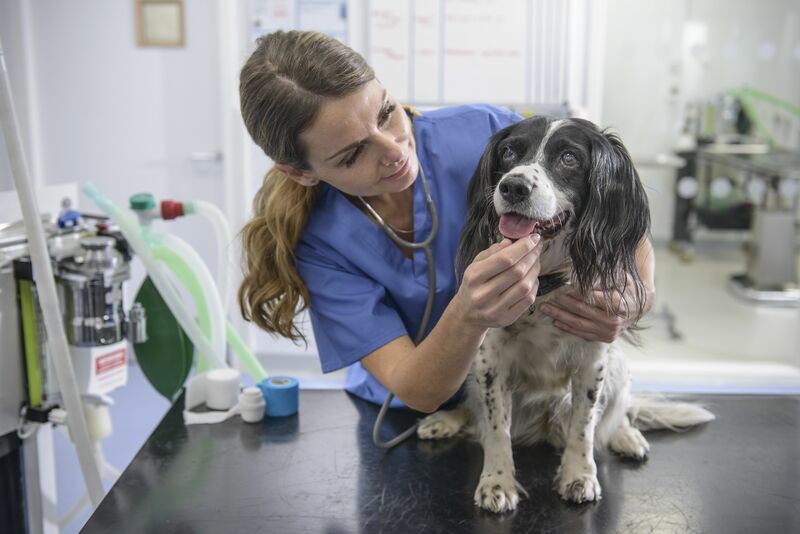 People who work as Veterinary Technicians learn the necessary handling skills and knowledge by attending veterinary technical school or by learning the skills on-the-job. What is involved in a veterinary technician career? What is the salary range for this career? Learn the answers to these questions and more here. Veterinary technicians also go by the term veterinary nurse and may also have the initials LVT, RVT or CVT after their name. What does it take to be a technician, and what do those letters mean? Find out in this FAQ. Each year, the third week of October is designated National Veterinary Technician Week by the National Association of Veterinary Technicians in America (NAVTA). Learn about NAVTA, the history of Vet Tech Week, and what vet techs do everyday in veterinary practice. Laura is an Ophthalmic Technician at a busy veterinary emergency and specialty clinic. Read what her "typical day" is like. I interviewed Jenna Stregowski, RVT, a vet tech and fellow Dogs Expert for her perspective on veterinary technician careers. Lisa Randon RVT VTS(Anesthesia) of Allandale Veterinary Hospital and "Winston," who had a fractured femur in Jamaica. Like veterinarians, veterinary technicians may choose to specialize in an area of medicine or surgery. In this interview, meet Lisa Randon RVT VTS (Anesthesia) of Allandale Veterinary Hospital in Barrie, Ontario, Canada. Lisa has completed additional training and certification in veterinary anesthesia. Melissa Spooner, LVT, VTS (Behavior), BS, KPA-CTP / Oakland Veterinary Referral Services. In this career interview, meet Melissa Spooner LVT VTS (Behavior) BS KPA-CTP of Oakland Veterinary Referral Services. Melissa is one of only 11 Academy of Behavior techs in the US. Learn what a "typical" day is like for Melissa in a practice dedicated to veterinary behavior. This article is an introduction and first post for Bethany, who was a legal assistant prior to attending vet tech school in 2005 to prepare for a career as a veterinary technician. Bethany has since graduated, and is now working as a veterinary technician in a busy practice. Complete listing of Vet (and Tech) School Diaries can be found in the Pre-Vet and Career forum. Are you curious about what life is like as a veterinarian or veterinary technician? What other "animal-related" careers are there for those who do not wish to pursue vet school? How is a specialty referral hospital different than an emergency clinic? Find the answers to these questions and more in these "Day In The Life" stories submitted by viewers working in various animal-related fields. The life of a vet tech is often demanding; long hours, lots of lifting and lots of cleaning up of smelly substances. Not to mention the chance of getting bit or scratched while assisting the doctor with a variety of pets. Is it worth it? Does the love of animals override the demands? Is the salary adequate for the demands and responsibilities of the job? Read some opinions from viewers. After learning about this career and reading responses and opinions from other viewers, what do you think? Can love of animals and an income commensurable with job-related experience and duties coexist? Viewers weigh in on the topic vet tech careers and earning potential.